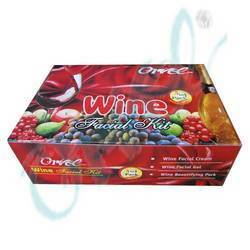 Our range of products include wine facial cream. We offer Wine Facial Cream, which is an excellent rejuvenating agent for skin as it de-stresses the skin thereby making it feel and look more fresh and healthy. Extracted from natural herbs, these skin friendly products protect facial tissues from direct sunlight, dust and pollution. In addition, this facial cream is appreciated for its hygiene and purity. Looking for Facial Creams ?